Cooking for yourself for the first time can seem like a daunting task, but it’s also incredibly liberating. You don’t have to eat everything on your plate or the nasty veggies that your mom makes. You can eat whatever you want. However, you don’t really know how to cook. This should not give you license to subsist purely on Lean Cuisine, hot pockets or take-out. Here are five simple cooking techniques that will help you get started in the kitchen. 1. Using your Knife. Most people hold their knives like they are Rambo going into battle. The meat is already dead, and I don’t think the vegetables are going to come to life any time soon. 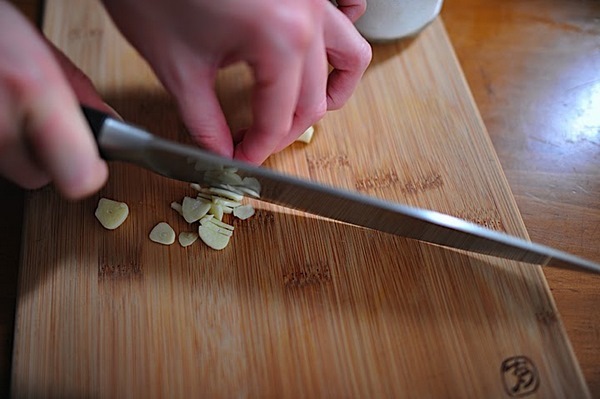 Knowing how to hold a knife and chop properly will help you be more efficient and look like a real chef. So, you should hold your knife by placing your thumb and index finger at the back of the blade. It’s almost as though you are pinching the blade, and your other three fingers wrap around the handle. Also, when you are chopping try not to lift the tip of the blade off the cutting board. Both of these tips will help you have more control when you are cutting and be able to cut things up faster. 2. Vinaigrette. A simple vinaigrette goes a long way and is made entirely from pantry ingredients so is wallet friendly. Traditionally, a vinaigrette is one part acid (citrus juice and/or vinegar) to three parts oil, but that is not a hard and fast rule. I like my dressings really tangy so mine are generally one part vinegar to two parts oil. Add salt and pepper and whisk the two together. You can also add mustard, herbs, garlic, shallots, and/or honey. Vinaigrettes are great because you can mix and match the flavors you like best. My favorite is: 1 tablespoon balsamic vinegar, 2 tablespoons olive oil, 1 teaspoon Dijon mustard, 1/4 teaspoon basil, and a pinch of salt and pepper. I like to make extra vinaigrette, so that I can use it the next day to dress leftover rice, couscous or pasta. It also makes a great marinade for meat. 3. Cooking Eggs. Eggs are such a versatile ingredient. They can be used for breakfast, lunch and dinner and everything in between. Yet, the one question I get the most from my friends is: How do I hard-boil an egg? The answer is: put the egg(s) in a pot with cold water and bring it to a boil over medium-high heat. Once the water comes to a boil let it continue to boil/simmer for 10 minutes. Hard boiled eggs are great additions to salads of all kinds, and I like them plain with a little balsamic vinegar drizzled over. Eggs can also be used to make omelets or “fried” quickly to be added over pasta, vegetables or toast. You can also make a fritata, which is quiche without the crust. Eggs are a great way to use leftovers or vegetables that are on their way out. 4. Cooking Meat. I lived in a townhouse with twelve other girls for a semester (absurd, I know), and it was interesting to see how each of them dealt with cooking meat. Some were so afraid of it that they wouldn’t even buy meat, and others would over cook and dry out their meat to really “ensure” that it was fully cooked. Pan-frying your meat is actually quick and simple. First, let your pan heat-up over medium-high heat for two minutes. Then add some kind of fat to the pan. This helps the meat brown, or caramelize, on the outside and not stick to the pan. You could use butter, oil or cooking spray. Just know that if you chose to use butter then you shouldn’t put the pan on anything higher than medium heat because the butter will burn. Olive, canola, and vegetable oil can be heated to higher temperatures, so you put your pan on medium-high heat with these suckers. Also, you will know when the pan is hot enough by flicking a little water into the pan, and if the water snap, crackle, pops then you’re ready to add the meat. Just make sure the oil isn’t smoking! The meat needs minimal prep. You can either throw it in a marinade or pat it dry so that it will brown really well and add, salt, pepper and any other spices you want. Then you add it to the hot pan and turn it once, maybe twice. I know it’s hard to resist, but you shouldn’t move the meat around too much when cooking it because it won’t cook evenly. How long you cook the meat on each side depends on how thick the cut is, but a good way to tell how done it is to poke it with your finger. The finger test method may seem scary, but I promise you won’t burn yourself. You really shouldn’t cut into the meat because if its not done all the juices inside that keep it moist and yummy will escape. You can simulate different stages of doneness on your hand for practice. So, relax your hand. Now poke the fleshy area at the base of your thumb with the index finger from your other hand. That is what raw meat feels like. Now, gently bring your thumb and index finger on the same hand together. Don’t press them together. Again, touch the fleshy area underneath your thumb with your other index finger. This is what rare meat feels like. Now gently bring your middle finger and thumb together, and when you poke it that should be what medium-rare meat feels like. Gently bring your ring finger and thumb together. This simulates the feeling of meat cooked to medium doneness. Lastly, gently bring your pinky and thumb together and this should show you what well-done meat feels like. This is something you will have to practice, but it will eventually become second nature to you. 5. Roasting. Roasting vegetables and meat is one of the easiest things you can do to maximize the flavor of your food. Roasting something means you are cooking it uncovered at a high heat, generally 400 degrees or higher. For your vegetables, preheat the oven to 425°F, and then toss your chopped vegetables with olive oil salt and pepper on the pan. Pop it in the oven for about 8-40 minutes. The length of cooking time depends on what kind of vegetable it is and how small it is cut up. You will know when they are done when they have browned slightly and are soft when poked with a fork. Roasting meat is harder to give generally guidelines to, so check recipes for exact temperatures and time lengths.